The look at Monika Chiang tends to be very natural and bare, but it wasn’t the case for fall. For this season, mystery, flights and birds inspired her, making the beauty look super cool and unique. The collection featured a lot of high collars so Aveeno Celebrity Hairstylist Patrick Melville and Monika Chiang collaborated together and came up with a chic faux hawk. “I wanted to do something that was a little more fun, as opposed to just putting it up,” said Patrick. He applied some pomade to give the roots some body, then counteracted it with Aveeno Pure Renewal Dry Shampoo to create texture and hold. We got a serious case of nostalgia when we noticed what Patrick used to get the faux hawk ponytail. A banana clip! Suddenly, we felt the need to stock up on those old-school hair clips ASAP. The mystery continued over in makeup where Lancome National Makeup Artists Tarek Abbas, Darais and Alex Sanchez created a flawless smokey eye with a hint of green at the corner. “Green is going to be hot for fall,” said Tarek. The icing on the cake was a major lace imprint on each side of the eyes. Tarek attached a piece of triangular lace onto a sponge to make a stamp. He applied gel eyeliner as the “ink” and then stamped in on the face. “What’s more mysterious than lace?” said Tarek. The face was kept matte and the lips were matte as well. 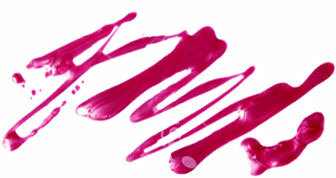 “I kept it creamy and shiny, but without the sparkle of a lip gloss,” he said. Tarek lined and filled in the lip with Lancome Le Lipstique in Natural Mauve, and then applied Rouge in Love in Sweet Embrace on top. 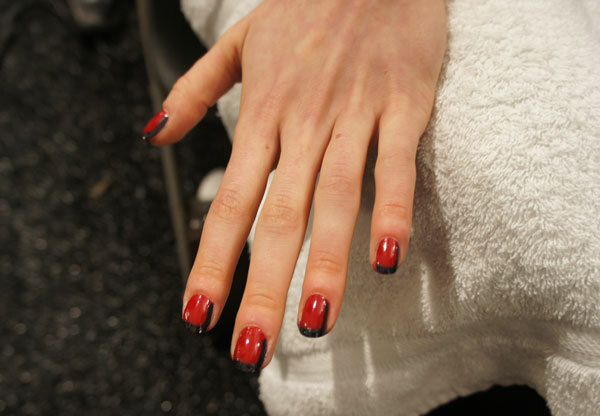 The nails, also by Lancôme, were adorned with a cool asymmetrical French mani. Nails were painted red (Vernis in Love in Madame Tulipe) and the French was a deep blue (Vernis in Love in Noir Caviar). The line went across the tips and down one side of the nail. The tips were also lined with gold. We think that this new type of French Mani will be making its mark on 2013.